Alongside my experiences with Sutton Theatre Company, Hagon Happenings and ICOS, I have appeared with a number of other societies in SE England. Derek Drennan (Big Jule) and Bill White (Nathan Detroit) in "Guys And Dolls"
In early 1996, I heard that Wallington Operatic were looking for men for their forthcoming production of "Guys And Dolls". At the second rehearsal, I was asked to do a read the part of Big Jule, the large, Chicago-based crapshooter, and thought this was merely an audition to join the Society. Little did I know that I was actually auditioning for the part, and would have to maintain the gruff voice I had experimented with and spend the week of the show wearing a bulked-up pantomime costume over my oversized purple suit. I went on to perform four Spring shows with Wallop, playing small parts in each, and took part in their Christmas show in 2003. Wallington's backstage crew were probably the best organised in the area, and I had an enjoyable time when I worked backstage for the production of "South Pacific" in 2000. Like all other societies, Wallop had their social side too, and everyone looked forward to "Chinese Night" on the Friday of show week. In 2000, I joined Mayhem for their production of Stephen Sondheim's "Into The Woods" I am a great fan of Sondheim's shows, and really enjoyed my dual part of The Wolf and Cinderella's Prince. 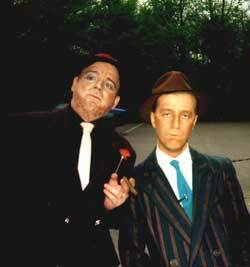 I returned to the Company again in 2005 to play Walter de Courcey in "Chess" - one of my favourite shows. During the run of "Into The Woods", I was asked to join Lyric Players for their production of "A Little Night Music" - another Sondheim show - so it was easy to accept. I went on to appear in five Lyric shows, the last one being "Fiddler On The Roof", when I reprised my role of the Russian Tenor. Over the years, I have also appeared in performances of G&S operas with Cheam Operatic, "Cabaret" (Kingston Operatic Society(, "Merrie England" (The Christopher Singers), and single performance concerts of "Merrie England" (Walton on Thames) and "Summer Song" (Kingston Orpheus Choir).